Topics: Gallery, Commissions, Exhibitions, Residency, and Jcworks. 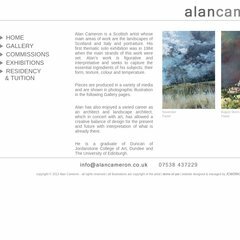 alancameron.co.uk Alan Cameron | Scottish Artist | Landscapes, seascapes, portraits ..
Its 2 nameservers are ns59.1and1.co.uk, and ns60.1and1.co.uk. It is hosted by 1 1 Internet Ag Baden-wurttemberg, using Apache web server. Its local IP address is 82.165.103.205. PING www. (82.165.103.205) 56(84) bytes of data.